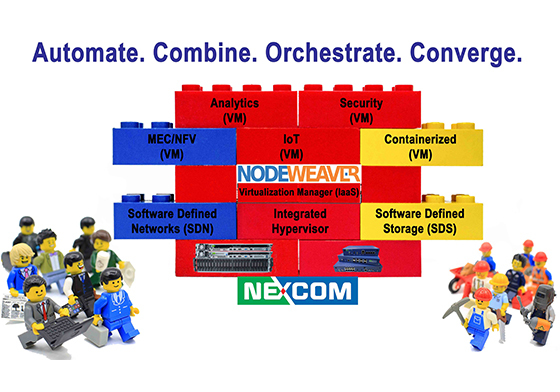 NodeWeaver, a premier innovator of hyperconverged infrastructure (HCI) systems is partnering with NEXCOM International (TWSE:8234), to bring software-defined solutions for mid to large-size organizations, adding to their robust portfolio of enterprise-class technology solutions and information management strategies. NodeWeaver provides an easy to manage HCI platform that reduces complexity while maximizing customers’/partners’ IT investments with performance acceleration, storage capacity utilization, and industry-leading fault tolerance for high-demand applications running enterprise IT workloads. "The partnership with NEXCOM is of particular importance for NodeWeaver, as it provides a tested and optimized hardware platform that is designed from the ground up for complex and demanding environments, characteristic of edge and industrial control systems.” said Carlo Daffara, CEO of NodeWeaver. “NEXCOM 's extensive hardware line and exceptional engineering resources will give NodeWeaver's customers the perfect execution environment no matter where deployed or in which environment." NEXCOM’s Desktop appliance, DTA 1160 with Intel 8C-16C Atom® Denverton (designed for vCPE and VNF use cases such as SD-WAN), and the Server-Grade NPA7100 (Dual Xeon® Scalable Processors for datacenters and larger edge use cases); combined with NodeWeaver HCI software achieves the optimal balance of performance, density and capacity to flexibly match any workload and requirement. NodeWeaver is a zero-management Edge cloud fabric - integrating storage, networking and virtualization in a single system. NodeWeaver features an easy to use interface and a management system that automates most tasks and simplifies activities that would otherwise require highly skilled expensive personnel. NodeWeaver delivers linear and predictable scale-out without large up-front investments; start small and expand your infrastructure as you need, one node at a time. Having a unified compute, storage and networking platform enables your organization to deploy the applications you require without complex planning and procedures. Nodeweaver’s Distributed File System aggregates internal and direct-attached storage resources across all nodes, presenting it as a single storage entity and making it available to all hosts.